Is my membership still valid? How do I renew? Sign in to SCMR.org. 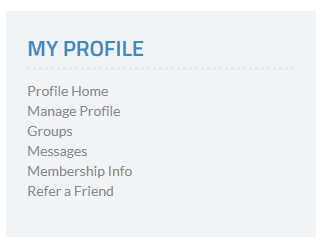 Select “Membership Info” in the “MY PROFILE” box on the right of the SCMR home page. Alternately, you can get there through "Manage Profile" and then select “Membership” under the “INVOICING, PAYMENTS & HISTORY” section of the page. The status of your membership will appear with renewal options. Sign in to SCMR.org. Select “Manage Profile” in the “MY PROFILE” box on the right of the SCMR home page. Select “Edit Bio” under the "INFORMATION & SETTINGS" section of the page. How can I access my invoices for dues or event registration? Sign in to SCMR.org. Select “Manage Profile” in the “MY PROFILE” box on the right of the SCMR home page. Select “Invoices” under the “INVOICING, PAYMENTS & HISTORY” section of the page. From here you can filter invoices by status. How can I pay invoices for dues or event registration? Sign in to SCMR.org. Select “Manage Profile” in the “MY PROFILE” box on the right of the SCMR home page. Select “Invoices” under the “INVOICING, PAYMENTS & HISTORY” section of the page. The invoices will default to “open” invoices. Click on the “pay this invoice” icon and enter your payment information. How can I retrieve my registration details for events? Sign in to SCMR.org. Select “Manage Profile” in the “MY PROFILE” box on the right of the SCMR home page. Select “Event Registrations” under the “INVOICING, PAYMENTS & HISTORY” section of the page. Event registrations will appear and be sorted by upcoming and past events. Click the printer icon to print a registration receipt. I am unable to log on to SCMR.org. Why is this happening? Are you using the correct username or password? Contact HQ@SCMR.org for help resetting your username and / or password. Has it been more than a year since your last log in? Your account may have been suspended. Contact HQ@SCMR.org to renew your membership. Is there an old email associated with your account? Contact HQ@SCMR.org for help resetting your password. I selected “Click here to reset your password” but am not getting an email to do so. Your email may be out of date. If this is the case, the system is trying to send your password reset to the old email. Contact HQ@SCMR.org for help resetting your username and/or password. As an SCMR member, how do I get the submission fee discounted to publish in JCMR? Authors who are members publish for $500 (instead of the full APC of $2,500). There is no need to submit a waiver code to redeem the discount, simply indicate that you are an active member of SCMR and it will be verified by the SCMR office. I would like to take the Introductory Course in CMR. How do I do this? The course is free of charge to SCMR members and BSCMR members. SCMR members need to sign in before taking the course. BSCMR members should first contact HQ@SCMR.org for a promo code to waive the $10 fee. Non-members must create a guest account first to take the Introductory Course in CMR and then sign in using that account information. The introductory course is located here. How do I apply to be a Fellow of SCMR (FSCMR)? We recommend beginning with the Criteria for FSCMR before starting the application process. Once you have determined that you are eligible, you can apply online by completing the form that coincides with your track (Research, Clinical, or Technologist), uploading required documents, and paying the fee. Remember to sign in as a SCMR.org member before completing the form. For more answers to your questions about FSCMR, check out FSCMR FAQs. How do I apply for a Letter of Certification? First, view the criteria for the level you are applying for. Once you are assured that you meet the criteria and have the proper documentation, apply online by completing the form, uploading your documents and paying the fee. To receive the member discount, you must sign in to SCMR.org before completing the submission form. How do I get a Certificate of Attendance for the Annual Scientific Sessions? You can access a certificate once you submit the evaluation - which is sent to all attendees via email at the completion of the meeting. If you have not received an invite to complete an evaluation after the meeting, contact Meetings@SCMR.org. How do I obtain CME/ CTE credits for a meeting? You will receive a certificate for your files once you submit the evaluation that is sent to all attendees via email at the completion of the meeting. If you have not received an invite to complete an evaluation after the meeting, contact Meetings@SCMR.org. I am a physician, how do I claim Maintenance of Certification (MOC) credits for a meeting? You must include the following information on your meeting evaluation form which is sent to all attendees via email at the completion of the meeting. If you have not received an invite to complete an evaluation after the meeting, contact Meetings@SCMR.org. How do I get a program endorsed by SCMR? Once you are sure that the course has met the criteria, complete the form at the bottom of the page along with a faculty list and syllabus for review. Please allow 5 to 7 business days for approval. How do I submit or update a Fellowship Opportunity for the SCMR website? To submit or update a fellowship listing, use this form or contact HQ@SCMR.org.